The holiday season is in full swing with Christmas just a few days away. The sugary and fatty foods to avoid when trying to lose weight are a constant temptation this time of year. Knowing how to avoid junk food in order to continue losing weight will leave you mostly successful but be sure to recognize that it is unlikely you will be able to avoid them completely. The following 6 tips will help you stay on track this holiday season without feeling deprived! 1. Eat Breakfast- Saving your calories for the big meal is a bad idea because the hungrier you are the more likely you are to over eat. Eating a small meal in the morning will jump start your metabolism and can give you more control over your appetite. Start the day off right with a nutritious breakfast packed with protein and filling fiber. 2. Lighten Up- Traditional holiday dishes can be made healthier with less fat, sugar and total calories. Try replacing sugar with natural sugar substitutes like honey and apple sauce. Reducing the amount of butter and oil used is an easy way to cut out a ton of calories. Use fat-free chicken broth to baste the turkey and make gravy. 3. Be Greedy with Calories- Survey the table and decide what foods you absolutely can’t pass up. Don’t waste your calories on foods you can eat year round. Save your calories for those foods that only come around during the holidays. 4. Monitor Alcohol Intake- Calories from alcohol add up quickly. One glass of spiked eggnog contains 440 calories, 19 grams of fat and 11.3 grams of saturated fat! Reduce the amount of calories you’re getting from alcohol by setting a two-drink limit. Sparkling water is a great alternative- you’ll stay hydrated and still feel like you are celebrating! 5. Focus on Family and Friends- The holidays are not just about tasty treats, they are about celebrating relationships with family and friends. Focus on living in the moment and cherish the special time spent with the ones you care about the most. 6. Be Realistic- The holidays are a time of celebration and fun. 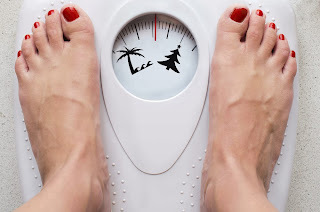 Strive for weight maintenance rather than weight loss so you can enjoy the holidays without feeling deprived. Moderation is the key during the holiday season so, savor every bite, treat your body right and be ahead of the game going into the New Year. The sugary and fatty foods to avoid when trying to lose weight are a constant temptation during the holiday season. Make a plan incorporating these 6 tips before heading to a Christmas party or dinner and you can successfully enjoy a healthy holiday season! Visit www.bariatricdirect.com for more tips and information on healthy living.